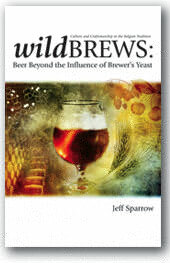 Jeff Sparrow’s Wild Brews: Beer Beyond the Influence of Brewer’s Yeast is a major contribution to the literature on lambic beer. In this book the author does not only discuss traditional lambic but Flanders red ale, Flanders brown ale, and contemporary (American) wild ale as well. If anything, this book is testament that spontaneous fermentation and brewing with other yeasts then Saccharomyces is not dead. After being introduced by New Belgium’s Peter Bouckaert, the book starts off with the obligatory account of how the author became interested in the beers he loves to write about. In this case the author is traveling in in Europe, ends up in Chez Moeder Lambic in Elsene, Belgium, orders a lambic “with some odd tropical fruit” and is told by the bartender to try Cantillon Rose de Gambrinus instead. This experience, and a later experience with a vintage bottle of Liefmans Goudenband (old recipe) set the stage for an enduring interest in the wild brews of Belgium. The recovery of traditional lambic and the movement to brew wild ales in other parts of the world raises the obvious question if lambic can be brewed anywhere else than Brussels and the Payottenland. Brewer Frank Boon reportedly said “you can’t” but Cantillon’s Jean-Pierre Van Roy believes that spontaneously fermented beer can be brewed in other places in the world. These answers are not mutually exclusive. If lambic beers are defined as spontaneously fermented beers that are brewed in Belgium’s Payottenland, it is evident that lambics cannot be brewed in any other part of the world. If the defining character of lambic is true spontaneous fermentation, all bets are off. And if lambic is defined solely by its flavor profile, the character of lambics can be approached by controlled fermentation with non-traditional yeasts and bacteria. In his book 1990 “Lambic”, Jean-Xavier Guinard argues persuasively that the temptation to ride on the popularity of lambics should be resisted and that this label only needs to be used for the traditional brews of the Payottenland. On the other hand, when brewers in other parts of the world employ the authentic traditional techniques such non-Belgium lambics could help to save the tradition from extinction. Sparrow devotes some effort to distinguish between Flanders red ales (sour ales), Flanders brown ales (oud bruin) and lambics. In the case of lambics such distinctions are clear but the attempt to distinguish red ales from brown ales looks more challenging. One cannot just tweak a little with another beer style and get a lambic but the dividing line between the Flanders ales can appear quite arbitrary, although one could mention that the the presence of Acetobacter sp. contributes to the more pronounced presence of acetic acid in the reds. But reading his account of the Flanders sour ales, it seems that these beers are more vulnerable to disappear than lambics. This is ironic because modern examples of such beers are produced in ways that would be considered taking lazy shortcuts by traditional lambic standards. This raises the question of how the production of a traditional Flanders sour ale be distinguished from a traditional lambic, a topic that is discussed at various points in the book. Although most lambics that are consumed today are gueuze and fruit lambics, one hundred years ago 90% to 95% of lambics were sold straight. Lambic brewers Cantillon and De Cam have bottled unblended aged lambic, but it is not likely that this style will catch on beyond locals, a small group of lambic connoisseurs and perhaps some adventurous wine drinkers any time soon. Sparrow mentions that traditional lambic brewers consider the differences between lambic and wine and between Gueuze and Champagne very small. Quite remarkably, the author also mentions that in Eastern Brabant the traditional white (wit) beers were produced by spontaneous fermentation as well. Fruit and herbs were often used in the production to balance the sourness of the beer. The addition of herbs has remained a staple of Belgian white beers such as Hoegaarden but the tradition of spontaneous fermentation has been abandoned. The third chapter about drinking wild beer has lot of information (including a number of maps) about most of the major existing producers of traditional lambics and wild ales and makes the book quite useful as a reference. There are also interesting tidbits of information about the evolution of some brewers, which often means the transition from a traditional product to something with more mass appeal (such as the reduction of aged beer in Rodenbach Classic to make it sweeter). This chapter really shines in its description of the traditional lambic brewers; their formation, history and brewing approach. Sparrow’s description of 3 Fonteinen’s unorthodox “temperature controlled” barrel stores has taken a completely different meaning since the 2009 disaster that cost the brewery most of its years product and contributed to DeBelder’s decision to stop brewing and return to blending. The United States is also discussed and includes some interesting information on smaller experiments with wild ales around the country. Also featured, of course, is Russian River, the California brewery that has done a lot to promote sour ales in the United States and who can give many Belgium brewers a run for their money. Interestingly, Jeff Sparrow also discusses the history and brewing of Mestreechs Aajt, a rather peculiar sweet-sour blend of Dutch Oud Bruin, lager bockbier, and a (presumably) spontaneously fermented base beer but notes that production stopped in 2005. A recent sales sheet, however, indicates that the Dutch Gulpener brewery resumed producing this beer again in 2009 and that it is available in kegs for draft. The technical treatment of lambic brewing covers much of the same ground as Jean-Xavier Guinard’s 1990 book on the topic but adds a lot of interesting details, photos (including microscopy images) and tables. In the case of Sparrow’s book there is, of course, also the technical treatment of the production of Flanders reds and browns. Most impressive, and somewhat of a neglected topic in Guinard’s book, is the extensive discussion of the characteristics, selection and maintenance of barrels, an element of traditional lambic brewing that requires a lot of expertise, which further adds to the mystique of lambic brewing. In his discussion of barrel choice, the author mentions the ability of some lambic connoisseurs to detect the original use of a “new” barrel in a blend. Breweries such as Belle-Vue, Cantillon, and Oud Beersel also use chestnut barrels in addition to oak. Wild Brews is great book for lovers of traditional lambic. Highly recommended.